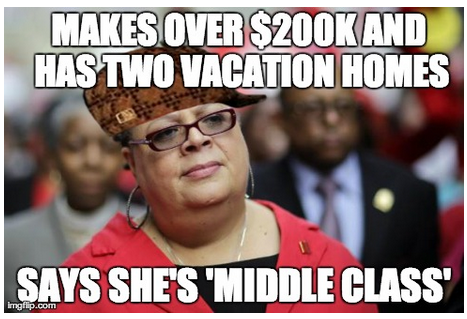 CTU Boss Karen Lewis Has Two Vacation Homes, Claims She's "Middle Class"
Give the Truth Team a home in Union Pier (although...we'll be honest...we'd prefer New Buffalo!) and a home in Hawaii and a $200K annual salary and you'd never hear from us again. But...Chicago Teacher's Union Boss Karen Lewis? She's check all those boxes (the $200K annual salary, the two vacation homes), but she still insists that she's 'middle class'. Now...listen...we're not ones to play the class warfare card, but we can't help but see the irony here. Chicago Teachers Union boss Karen Lewis is defending her six-figure salary and three homes -- one of which is in Hawaii -- as "solidly middle class." According to the paper, Lewis and her retired teacher husband own a Hawaiian condo, which they bought several years ago for $240,000, in addition to their home in Chicago's Kenwood neighborhood, purchased in 2007 for $405,000. She and her sister share ownership of a vacation property in Union Pier, Mich., priced at $305,000.